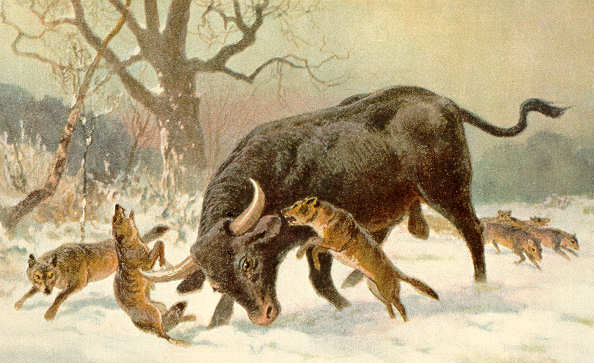 The ancestor to domesticated cattle, the aurochs sounds like the dinosaur of grazing hoofed things. Measuring as tell as six feet at the shoulder and weighing as much as 1,500 pounds, according to Wikipedia, these animals possessed some major muscle, which made their purportedly fierce tempers all the more dangerous. Yet we domesticated them, we turned them into common cows (presumably using the same unnatural selection process that turned wolves into teacup poodles), and then, in 1627, the last aurochs died in Jaktorow Forest in Poland. All of this was news to me as of Saturday, when I read about the aurochs for the first time. For the life of me, I can’t remember why or how I learned about these animals, but I did. Then, just on Sunday, Spencer emailed me a link to a Cabinet article on the extinction of the aurochs and the efforts of some German, World War II-era zoologists, the Brothers Heck, to revive the species. It’s fascinating, and I strongly suggest you give it a read. 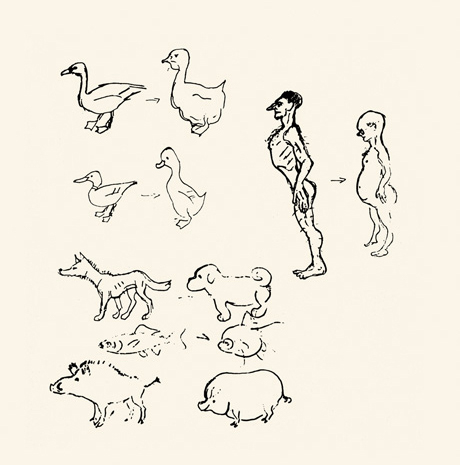 First, the Hecks believed that domestication ruined animals by inducing neoteny (the retention of juvenile traits in adults), and the Cabinet article evidences this believe with some rather primitive sketches of animals in their natural forms and then their suckier, mushier, tamer forms. It kind of looks like an adult drew some animals and then a child who couldn’t follow directions attempted to re-create the drawings. Yes, humans too. Remember, this was World War II-era Germany. And no, I don’t know what’s going on with that fish or why domestication apparently turned it into a giant single-celled organism. Science is weird! 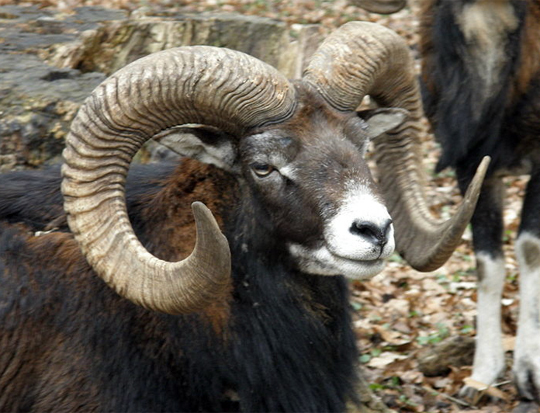 And secondly, the mouflon. The article mentions this animal, and because its name sounds like something delicious, I looked it up. It’s a sheep subspecies, and it’s quite regal. Is it wrong if I imagine that mouflon : aurochs : majestic forest wolf :: overfed 4-H sheep : constantly farting Holstein : bug-eyed Chihuahua that shakes when it’s not in the protective enclosure of its owner’s purse? The singular is actually "Aurochs", not "Auroch". That's because it's basically just a funny spelling of "Ur-ox". Ah yes. I knew that, but it's very tempting to make the singular "auroch," and I clearly gave into that temptation. Thanks for the correction.